Custom made hair clips in coordinating colors and fabrics to match any outfit. These can be ordered individually or as part of a matching set with any dress or skirt. Need the perfect match to your little one's new outfit? 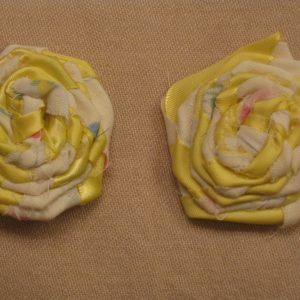 These rolled fabric rosette hair clips are a great solution! Made out of upcycled dress shirt material, rolled into a sweet rosette and affixed to an alligator clip to hold onto even the finest hair, these bows are a great finishing touch to any outfit. Need the perfect match to your little one's new outfit? 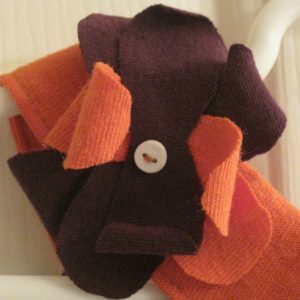 These upcycled T-shirt flower hair clips are a great solution! Made out of upcycled T-shirt material with a button center and affixed to an alligator clip to hold onto even the finest hair, these bows are a great finishing touch to any outfit.